A few years back I went to a Tuscan Adventure Cooking Class. I was a little disappointed because you were only placed on one dish assignment and although I was able to taste all the dishes I was not able to learn any techniques outside the cake I was assigned to. 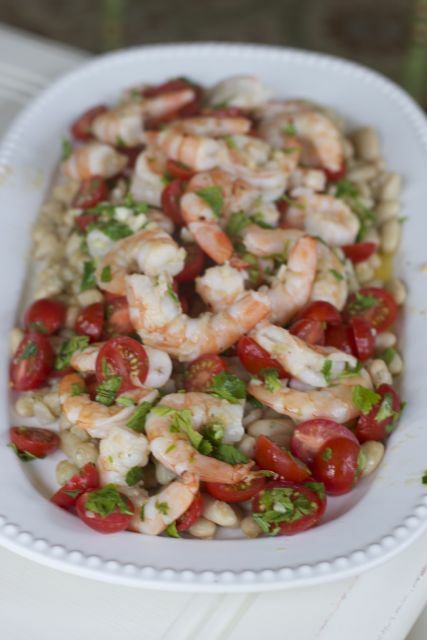 Anyway, I was browsing my binder of recipes and came upon the handout from the class and decided I would try to make this Shrimp with Cannellini beans dish for the family. I love shrimp dishes mainly because they are quick cooking and usually take on flavors of whatever you are adding. The dish felt very restaurant like as I never serve anything on beans. They were canned for convenience but the presentation looked gourmet. The most difficult part was peeling the shrimp. LOL. I could have purchased shrimp already peeled but when I can find it I prefer to by American Shrimp. Also a little more expensive but I think a much better tasting shrimp. A little sweeter I Think. Anyway, back to our dish. I did not have any fresh rosemary so I had to substitute dry but don’t think that mattered too much. When the recipe says to keep the beans warm, don’t leave the burner on, I think I dried out a few and had to add some more liquid when I realized my mistake. Then the whole dish really does come together easily. 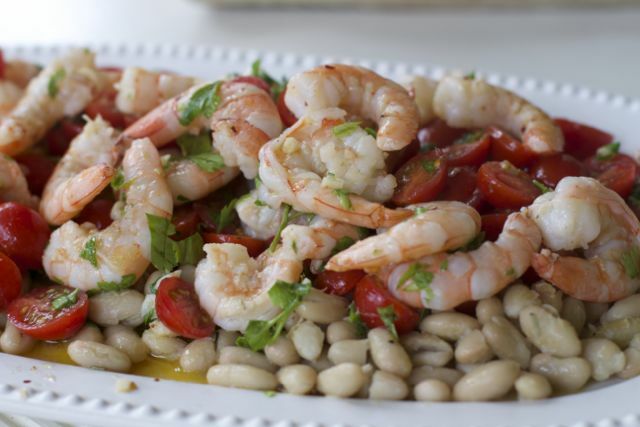 Just don’t plan on making this in advance of your dinner, cold shrimp and beans is not a great combo. 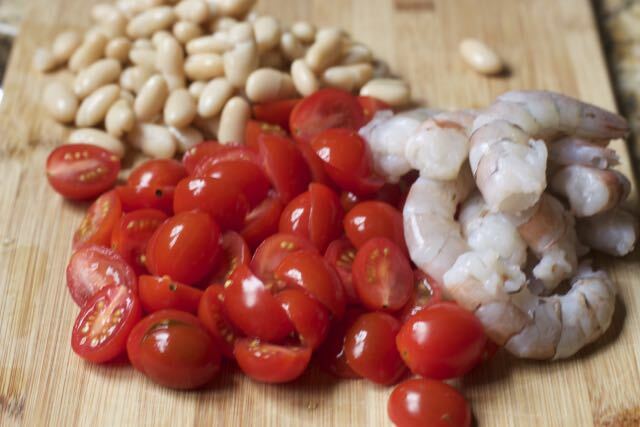 With the freshness of the cherry tomatoes and different textures of the beans and shrimp, this was a family favorite. I served it with a panzanella salad that I will be sharing in a few days. These two dishes were a complete meal and fancy enough for guests. Heat 2 TB olive oil over medium heat In a medium saucepan. Add beans, rosemary, and pepper. Simmer one minute and keep warm. Set a large skillet over medium heat, add the 3 TB oil, and when hot, toss in the shrimp to cook. stirring for about 1 minute Lower heat to medium and add the garlic and chili flakes, cooking until just before the shrimp are cooked through. Add the tomatoes and lemon juice. STir and remove from heat. Season as needed with salt and pepper, stir in parsley. Portion the beans onto the platter. Top with Shrimp Mixture. Great for the family or to serve to guests. What is your favorite way to serve Shrimp? You could probably grill the shrimp as well for summer time. 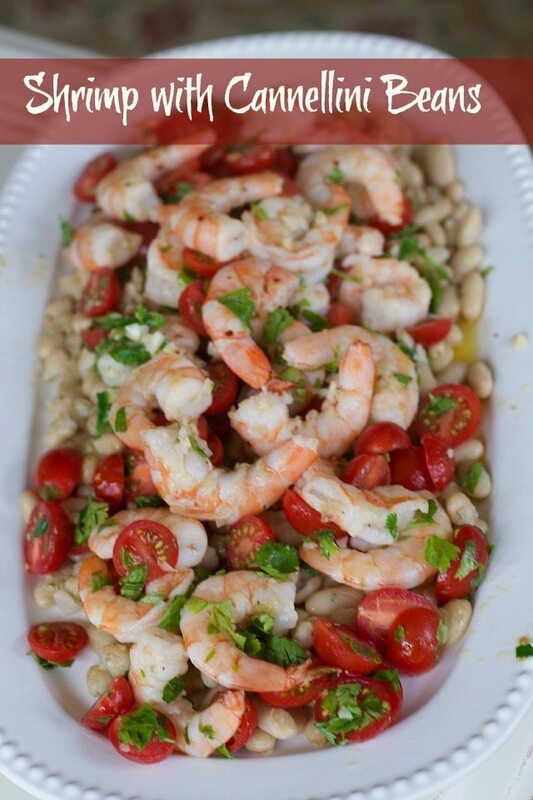 This is a wonderful shrimp dish I’d love to try for a fancier outdoor meal! Everyone in my family are big fans of shrimp. This recipe sounds like the perfect summer dinner. Light and healthy and flavorful! Shrimp is SO good! I am loving it all the time. This is a fun recipe for me. We need to add this to our meal plan! We love shrimp. Looks like a tasty recipe! That is a perfect dish. We love shrimp around here. This looks amazing! I haven’t had seafood in ages, can’t wait to try this. You’re right, this does look fancy enough for guests and I know my family would love this. They’re big shrimp eaters. 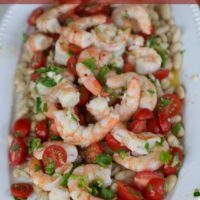 I prefer shrimp scampi but this recipe using the Cannellini Beans is something I would love to try. Oh my! This is making me so hungry. My son would go crazy for this shrimp recipe too. This looks amazing. My husband would love this for dinner. I would never had thought to add shrimp to beans. What a great idea. Thanks for sharing. May have to try it out. That sounds really tasty! Perfect for any shrimp lover.